Turbo Carver II offers the average person, the advantages of an Ultra High Speed, rotary air carving AND engraving instrument at an affordable price. The uniquely simple to achieve but elegant creations possible with this instrument can be done by practicality anyone, not just professionals. Turbo Carver II is the size & weight of a fine writing instrument! Its light weight and small size allows you to do more precise work than any of the other instruments. Carve for hours without fatigue! Turbo Carver II is the lightest, smallest, most tactile and comfortable tool for scrimshaw, carving, inlays and engraving of materials ranging from cork to ivory and even the hardest metals. 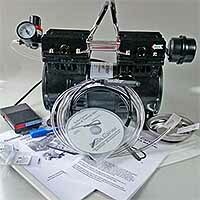 Completely LUBE-FREE, Turbo Carver Quiet Twin compressor system now has even more tools and accessories. We use a patented Anti Contamination device and a 5-micron air filter to prevent dirt from entering the hand-piece. Most other high-speed instruments create a vacuum that draws contamination into the front bearing, a leading cause of bearing failure. This is why some manufacturers require you to disassemble and clean the bearings on a routine basis. We have eliminated the vacuum with a patented pinched valve on the exhaust outlet. Another cause of bearing failure is heat buildup in the bearings. This regulator valve increases airflow through the bearings, keeping them cool while running at speeds up to 450,000 rpm. Soft Ergonomic Handle (Grip) and looped airline are designed with total comfort in mind, allowing for a good solid grip on the tool. The rubberized surface does not get cold in your hand like the metal hand pieces. Incredibly smooth and as easy to use as a pencil, Turbo Carver II like most ultra high speed engravers gives you the power to create beautifully detailed engravings and relief carvings in Wood, Glass, Bone, Stone, Paper, Leather, Hard Metals, Eggs, Antler, Gems, and the like. If you can trace a line, using our stencil systems, training video and the an ultra high speed hand piece you can create beautiful engravings and carvings on your first try. We are certain you will be delighted with the Turbo Carver II and we offer you a 30 day purchase price guarantee, and a 6-Month Manufacturers Limited Warranty on the Turbo Carver. Water Mist Spray prevents toxic dust & fumes. For just $100 more you can have the most sophisticated carving system ever offered! It also eliminates the need for a dust collector. Prolongs bur life, strengthens porous materials, gives a more polished cut and prevents heat fracturing. This unit can be turned on and off during a carving session and has a fine needle valve adjuster so that you can vary the amount of water that is be sprayed. The fine mist really suppresses the dust that is created from carving and engraving in Egg shell, Ivory, Bone, etc. are excited about our new Turbo Carver Tank less Air Compressor. This beauty is powerful, sturdy, & very quiet. The Twin Compressor is a Double Piston-type air compressor that is small and easily portable, with anti-vibration rubber feet. The Quiet Twin Air Compressor is Quiet & Powerful. This system comes all set up with a foot control, tubing lines, and air gauge ready to plug in and use with your Turbo Carver. Weighing only 24 pounds, it is portable, easy to use and requires no oiling. Very Quiet (59 decibels) and Great Looking this compressor is rated at, 2.8 CFM, 120 volts, 5.9 amps, 60 Hz, Overall dimensions:14" L x 10"W x 8"H.
Requires no draining or oiling as tank type compressors. Excellent air compressor to power high speed hand pieces. Easily adapts to Turbo Carver Systems.